Undoubtedly, the largest empire in the existence of human history was the Mongol Empire, once a hodgepodge of warring nomadic tribes from Central Asia before banding together under the banner of Temujin, better known as Genghis Khan. But what was the key to the Mongol Empire's size? Was the horse, the most ideal creature to use for long-distance travel, the exclusive reason? Or were there other factors involved? There are a number of tactical and strategic reasons that the Mongols were successful. Not only were the upper levels of military leadership strong, but the mid-level and lower level leadership was also very strong. They used whatever means necessary to defeat their enemies, including using direct confrontation by large forces, using of smaller forces in guerrilla tactics, deceit and subterfuge, etc. During an attack, local commanders had a broad outline of the campaign strategy, and also had the freedom to achieve their tactical goals as they saw fit. A common tactic was to intentionally tire their opponents horses. First they charged into battle, then feigned retreat, enticing their opponents to pursue. Once their opponents' horses were tired, the Mongols would switch to fresh horses, and return and massacre. It is important to note that the Mongols very much preferred their opponents to surrender, and most conquered areas came to be controlled in this way. Mongolian made crossbows and bows were the best in the world at that time. They were composed of compound materials and took a number of years to manufacture. They additionally kept Chinese engineering units in the field for events of siege warfare. Mongols treated surrendering populations very well; as they economical favored merchants and poor farmers over elites, the general population was well disposed towards them. Conversely, the Mongols "made examples" of opponents who fought back, and did not hesitant to brutally torture and kill those who took the field against them. They additionally deceived commoners and merchants about the size of their army; while it was modestly sized, they led their opponents to believe that they were had an enormous fighting force (a 'Horde'). Not only did this intimidate their enemies and the surrounding populace, it also led to tactical errors on the part of their enemies. Specifically, enemy armies expected many unskilled fighters, and instead they encountered smaller, sophisticated fighting forces. The Mongol data collection methods were very strong. As merchants benefited greatly from Mongol expansion, merchants eagerly provided information about the Mongol's enemies. As merchants knew the ruling classes and geography of to-be-territories, the shared information was of great value. The Mongol opponents, however, knew primarily what the Mongol PR told them: that in surrender they would be treated well, if they fought they would be not just defeated but annihilated, and that the Mongol army was enormous. The Mongols replaced the ruling elites in conquered areas, subsequently lowering tax burdens on farmers, artisans, and merchants. They also encouraged trade by establishing safe, easily travel-able trade routes across Asia, allowing safe trade for the first time in history between China, East Asia, and Persia, the Muslim world, and Europe. As they controlled a huge area, their lower taxes resulted in a huge revenue stream, to allow very strong logistical support. The Mongol forces stayed well supplied by both living off the land, maintaining a relatively small fighting force, encouraging merchant traders in conquered areas, and a large number of horses for direct logistical support during campaigns. They also had very strong communication between forces, using relays of riders. The fighters in Mongol units were very tough men - they grew on the plains as nomads, and were accustomed to thinking independently and solving problems, developing strong endurance while traveling with excellent horsemanship, while having a cultural tradition of respect for wise authority. In summary, Mongols were a very well organized, strategically and tactically strong fighting force, with a number of reasons for extensive success. Sources: While the wikipedia article is ok, I really respect entry in the Encyclopedia of Military History by Dupuy. They provide a very non-biased, factually based account of Mongol success. The anti-mongol propaganda, developed by the conquered elites in China, SW Asia, and Eastern Europe is definitely skewed, and still skews modern Mongol History until even today. In this regard, Dupuy did a fantastic job in conveying why the Mongols were successful conquerors. Your map shows primarily the Mongol conquered territories during Genghis Khan's time. Tamerlane, who was also a Mongol, conquered India and set up the Mogul empire, which through its effective administration taught the British economics, war, and management of subject populations, allowing them to eventually build their empire. In this regard, the British could be viewed as successors to the Mongol. The trade that flourish during Mongol rule gave western Europeans a taste for the luxury goods of East Asia; when the empire collapsed in the late 1300's, prices went up due to disruptions in trade, and the desire by European elites for luxury goods led to the beginning of colonialism and European expansion. Most of that huge area was and until today still is scarcely populated and thus not really "controlled", but rather "owned". Control is executed over people, cities, communities, important landmarks, important resources by the presence of military, militia and gov. institutions. And while the Mongols certainly had a lot of these under their control, most of their empire was desert and empty steppes with some small nomad peasant families here or there, over which they never had any real "control". Do not forget, that the Mongols never had the abilities to constantly monitor and evaluate of what is going on in that huge area. Modern huge countries with deserts and/or steppes like Russia and China do have these possibilities thanks to technical advancements. A good way to demonstrate the difference between control and ownership are the modern day maps of the so-called Caliphate of the so-called Islamic State. Modern day map of the so-called Caliphate of the so-called Islamic State. Here, you can see how the political power is not holding a bulk area but rather populous centres, the roads between them and some other important landmarks. The void in between, in this case desert, is not really "in control" by the power, simply because there is nothing to control. This is a more accurate picture of how political powers, especially in the past, did look. But since we do not have so much information in detail about what were the real controlled map parts, we tend to ignore the fact that not really all of the area was under control. PS: Also, I wanted to mention that the mongol empire was not the biggest empire in the world. By owned area, it was the British Empire and by individuals controlled over the total humanity population at their time, it was the Persian Empire under the Achaemenids. This is indeed an interesting and difficult question. Mongols defeated almost all states around them, and they certainly had no technological advantage or any superiority in the weapons. But this is not the first case in history when nomads defeated the more technologically advanced settled civilizations. (One historical example is the Hunns, and parts of China were conquered by the nomads many times). The conquest of Genghis Khan and his followers was just the greatest (of all similar nomad conquests) in terms of territory. 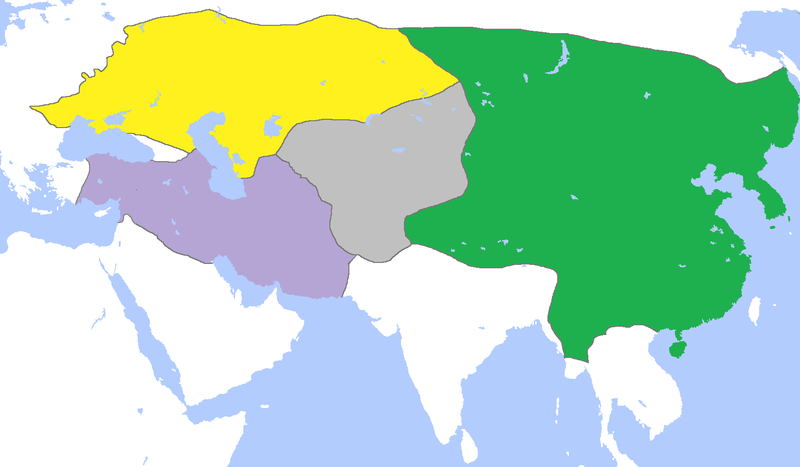 But notice that it was short lived: this huge empire was split into several parts in 2 generations after Genghis Khan. The general advantages which the nomads had over settled people is that they were extremely tough: they could survive the degree of deprivation which the armies of settled peoples could not. And war was the only occupation of almost every male. So they could create large armies, though they almost always were smaller than those of their enemies. But these are a general advantage of the nomads. What makes the Mongol stand out among other nomad conquerors, was an extremely effective organization. It seems that this is due to the extraordinary abilities of their leader, Genghis Khan. He was able to achieve a strong discipline, in a large army, and appoint outstanding commanders. (They say that Subudai-bahadur won more than 100 pitched battles and lost none. So he was by far the greatest military leader in history. And Jebe was probably the second). And none of Genghis Khan top commanders or close relatives ever betrayed him, another unique thing in history. His adversaries did not have this degree of cohesion, and had no social mechanism for appointing the most talented officers on key positions. In most societies of that time, commanders were appointed according to their birth, or noble origin, or court intrigues. In the Mongol army, promotion was clearly based on the merit. Subudai and Jebe were of very modest background. Mongols were able to adapt all necessary inventions from neighboring countries to their advantage. I recall that in the beginning they had even no writing. (The writing was adapted from the Uighurs). They had no idea how to take walled cities. Before they attacked China. After that they adapted Chinese technology and Chinese TECHNICIANS (!) to operate it. This only shows the outstanding abilities of their leaders. Another thing I want to mention is the ability and desire of Mongols to learn. Their superior military intelligence is frequently mentioned. The Russian chronicle, for example says "Came some Tartars, who they are, and where did they come from, nobody knows". The attitude of Western Europeans was not much different. This is in sharp contrast with Mongol's attitude: they KNEW where they were going, they knew all details about the situation in Europe when they came there. They knew what they needed to know. They sent spies. They did meticulous planning. Again this has to be credited to their supreme leadership. EDIT. I was asked to add references. The main primary source for the events before the death of Genghis Khan is the so-called Secret History of the Mongols. The standard English translation with comments is this: https://www.amazon.com/Secret-History-Mongols-Mongolian-Thirteenth/dp/9004153640 Many other translations in many languages are available (some free on Internet), http://altaica.ru/e_SecretH.php Based on this, and on somewhat later Arabic (Rashid-ad-din and others) and multiple Chinese histories, many books are available. A good one, covering the same period (before the death of Genghis Khan) is this: https://www.goodreads.com/book/show/983069.Conqueror_of_the_World It collects information from primary sources, with some reasonable comments, and makes a good reading. For those who prefer movies, there is a Mongolian-Chinese TV series called Genghis Khan (2004). I do not know in what languages it is available, I watched it in Russian. It is quite faithful to the "Secret History" in showing the events, but they somewhat gloss over the episodes which characterize Genghis Khan negatively (from modern point of view) and emphasize the episodes where he looks good. Nevertheless they do show everything mentioned in the Secret History. For example, they do not show the mass slaughter episodes, but one can easily guess what happens behind the screen. There is a biography of Subudai, Gabriel, Richard. "Genghis Khan's Greatest General Subotai the Valiant". University of Oklahoma Press, 2004, but it is not very good on my taste. The author just collected all sources that mention Subudai. I do not know any monographs about other top commanders (Jebe, Jelme, Mukhali, Khubilai). Not the Khubilai Khan, grandson of Genghis Khan, first Yuan emperor of China, but another Khubilai, one of the "Four Hounds" of Genghis Khan. Most authors, including Wikipedia confuse these two Khubilais. EDIT. Let me add one little remark to this long answer. We know that it took much more time and efforts of Genghis Khan to conquer and unite all Mongolian tribes, then to defeat North Chinese states and Khwarezm. In some sense, uniting Mongolian tribes was a greater feat. And certainly he had no advantage in weapons or technology when he did this. Expedition to Eastern Europe by his descendants was a small episode by comparison. 1/ the fragmented and disunited nature of china of the time. The ability for the Mongols to fighting only part of china and acquire Chinese allies was absolutely crucial for the mongol conquest. without this the Mongols would not have succeeded. this is a key factor in mongol success that is often overlooked. against a strong unified China the Mongols would not have been successful. 2/ strong unified politics leadership. (contrast with the Chinese) the Mongol empire quickly started to decay once the unified leadership fell away. politically the organisation and structure was not up to a enduring empire. Joint Force Commanders (JFCs) employ operational art, in concert with strategic guidance and direction received from superior leaders, in developing campaigns and operations. Operational art is the use of military forces to achieve strategic goals through the design, organization, integration, and conduct of strategies, campaigns, major operations, and battles. Operational art helps commanders use resources efficiently and effectively to achieve strategic objectives. Without operational art, war would be a set of disconnected engagements, with relative attrition the only measure of success or failure. Operational art requires broad vision, the ability to anticipate, and effective joint and multinational cooperation. Operational art is practiced not only by JFCs, but also by their senior staff officers and subordinate commanders. In terms of pitched-battles, the Mongol army was more than 700 years ahead of other armies (i.e. rest of us). The other armies never understood why they kept losing and the first 'Western' army that did were the USSR during World War II (influence from Golden Horde? ): doctrine of deep battle. To be clear, I am not saying that no other military leader since the Mongols had an ability in Operational Art. For instance, General Matthew Ridgway clearly demonstrated this during Korea War, 1950. Here's an article that explains the reasons for the rise of Mongol Empire and how it managed to get so big. Hope it helps. By intervening in the internal affairs of other large empires (China, Persia, Kievan Rus) etc., and winning. China, for instance, was split between the Jin and Song dynasties. So the Mongols allied with the Song against the Jin, and after defeating the Jin, gathered up Chinese "not Songs" against the Song. In Persia, the Mongols benefited from the fact that the Sultan of Kwarazem was at odds with his "boss," the Caliph of Bagdad. Each of them had to worry about the other, as well as the Mongols, so the Mongols beat both. In Russia, it was the "other way." They had beaten a Turkish people called the Cumans around the Caspian Sea. The King of the Cumans was the father in law of the King of the Galicians, (which later became part of the Ukraine), and he dragged his son in law into a war with the Mongols, and both lost. Not the answer you're looking for? Browse other questions tagged military cultural-history mongol-empire conquest or ask your own question. Why were the Mongols so victorious? Why didn't the steppe bow spread further? How big was the Golden Horde? Why did the Mongol Empire disintegrate so rapidly after its peak?